Art in the Open Students in Meg Griffith’s Spring Term art class created public works of art to draw attention to important causes in the community. McKenna Quatro and Sara Dotterer finish up installation of their project in Hopkins Green. Everybody knows that public art can add color and vibrancy to a city or town, but the students in a Spring Term class at Washington and Lee learned that it can also tell an important story about the community. Visiting Professor Meg Griffiths’ class, Artistic Collaboration and Community Engagement, required students to work with local nonprofits to conceptualize and make works of public art, then install them in the community. 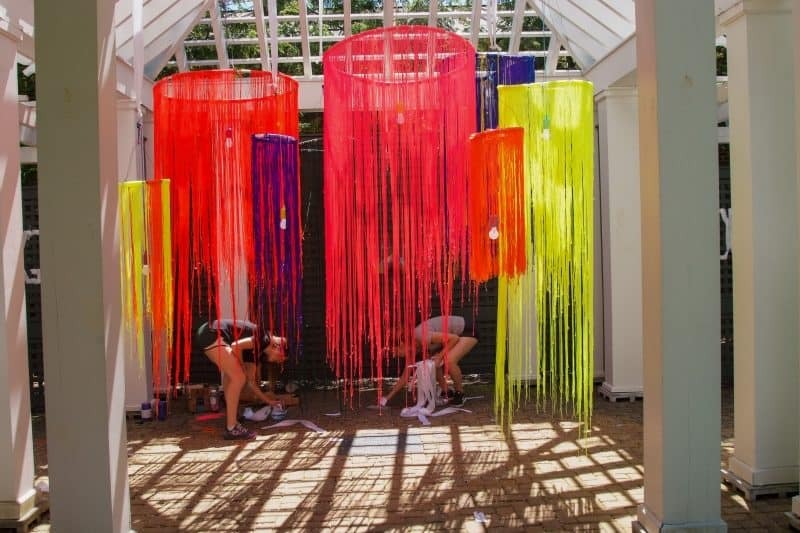 The result was a temporary exhibit at Hopkins Green in Lexington (visible through June 10) and a permanent installation at the Buena Vista Public Library. “It’s amazing how a space can be transformed just with some materials and a little hard work,” Griffiths said. To find nonprofits willing to work with students, Griffiths turned to W&L’s Shepherd Program for the Interdisciplinary Study of Poverty and Human Capability. Alessandra Del Conte Dickovick, who works with the program’s Community-Based Research Alliance, helped the class connect with Rockbridge Area Prevention Coalition, an arm of Rockbridge Area Community Services, and Saturday’s Child, a nonprofit organization in Buena Vista dedicated to youth enrichment. The small class consisted of only four students: One team was made up of Sara Dotterer ’18 and McKenna Quatro ’18, who worked with RACS, while Patrick Robertson ’17 and Archer Biggs ’19 worked with Saturday’s Child. The students first met with representatives to learn about the work done by the nonprofits in the community, and the challenges they face. This was followed up by research and brainstorming ideas for the art. Griffiths initially thought the process of selecting locations and obtaining permission from local governments to install the art would be a complicated one, but the nonprofits’ existing ties to the community were a boon. The idea was met only with enthusiasm. Dotterer and Quatro chose a conceptual theme of circles, with the spheres representing various subsets of one large community, like social circles, but also ideas and problems within those communities. They were inspired by the knowledge that many citizens of the Rockbridge area struggle with drug and alcohol addiction, and that future substance use is a danger facing many adolescents in the community. One goal of the class was to have students collaborate with local businesses to execute their ideas, all while staying mindful of the budget. Dotterer and Quatro had Lexington Building Supply craft their hoops out of PVC pipe. The hoops were then covered in brightly colored mason line, the nylon string used by bricklayers to ensure level rows. With the string hanging in layers from the hoops, the finished circles resemble vibrant octopi drifting in the breeze. Robertson and Biggs decided on a project that would allow children to contribute through hands-on activities. They erected a steel arbor on the lawn at the Buena Vista Public Library, positioning it as a gateway to two raised flowerbeds. Children from Saturday’s Child made and painted clay flower pots, which Robertson and Biggs filled with native flower species. 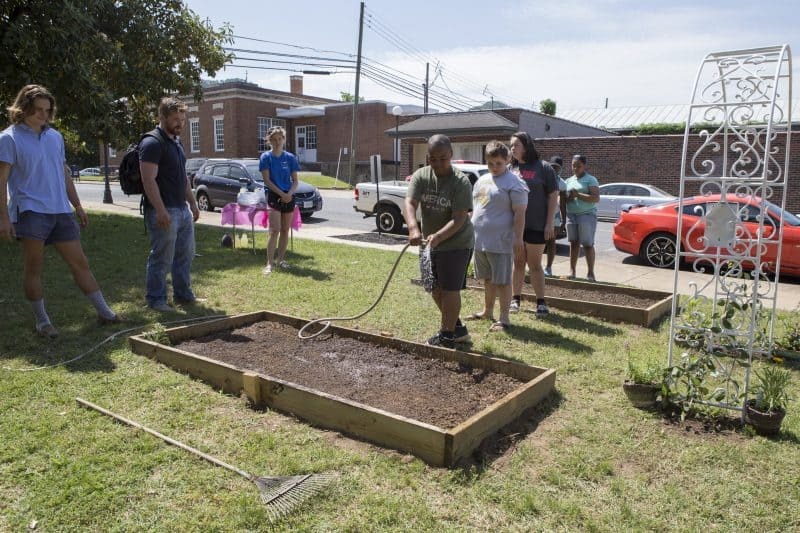 Children also planted flower seeds in the two raised beds during a dedication ceremony on May 20. Archer Biggs and Patrick Robertson, at left, look on as children water flower seeds at Buena Vista Public Library. The flower boxes are part of a public art installation by Biggs and Robertson. But the most important part of the library project was the arbor itself, which is meant to represent Buena Vista’s identity as a former steel town. Biggs and Robertson asked Premier Fabrication Solutions, a metal fabrication company located in Buena Vista, for help with the project. Two employees ended up building the arbor, and they only charged the students for parts. The students planted honeysuckle vine at the foot of the arbor, hoping it will eventually climb and cover the structure. Again, they chose a native plant as a nod to the local culture. All four students admitted that when they signed up for the class, they weren’t sure what they were getting into or what they would learn from it. As they sat back and admired the result of four weeks’ work, they realized that it taught them about budgeting, scheduling, critical thinking, overcoming setbacks, and collaboration within the community.